Welding is an expert skill, and many forms of construction, warehousing and transportation rely on quality welding for equipment and personnel safety. Welding is so important to safety and structural integrity that welders are required by law to meet specific welding safety standards to guarantee a minimum level of quality. Welding is a fabrication or sculptural process that joins material, usually metals or thermoplastics, by causing fusion. In the context of metal fabrication, the process fuses and permanently joins the two parent metals. A boilermaker is a trained tradesperson who produces steel fabrications from plates and tubes. The name originated from craftsmen who would fabricate boilers, and the trade of boilermaker evolved from the industrial blacksmith and was known in the early 19th century as a “boilersmith”. These days they may work on projects as diverse as bridges to blast furnaces to the construction of warehouse and mining equipment. Welders in Australia are required to complete their Boilermaker qualification (Certificate 3 in Boilermaker / Welding), and professional welders who specialise in fabrication welding are also obliged to comply with Australian Certification Code AS1554. This certification guarantees the highest standard of metal fabrication welding. To receive this certification, a boilermaker’s weld work must be previously qualified and checked by a registered NATA laboratory, proving the weld procedure and the welder qualification. For fabrication welding, structural engineers will specify AS1554.1 on their standards and drawings. This standard is designed to guarantee a minimal level of quality and outline requirements for product design, weld size, length and placement, and training and documentation requirements. As mentioned above, AS1554.1 requires the use of a certified tradesperson. This means you need not only a Certification 3 in Welding / Boilermaking, but also a tradesperson who has been tested in the last six months to the weld procedures approved by a NATA laboratory. Video of a qualified Bremco Metal Products welder fabricating a rhino hook. 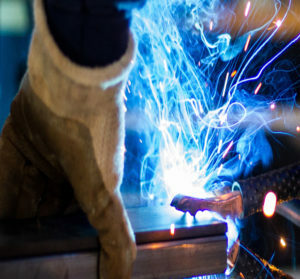 Welders must ensure that preparations, procedures and safety precautions are followed before welding takes place, and must then follow steps to perform a particular welding job. All fabrication and welding work must be completed using qualified procedures. A key component is a Welding Procedure Specification (WPS), a document that details all the settings the welder needs to use, ensuring that the standard is met, regardless of who does the job. Welder Qualification Records (WQR) are also provided as evidence that the welder has been tested adequately to the provided WPS. Finally, NDT records prove that the entire job has been tested with the correct test and to the appropriate percentage level. If repairs are required, they must be documented, and stored as records. GP welds are selected for static loaded or low stressed members, and this is the minimum level of testing generally required for fabrication welding. S.P are selected for dynamic loaded or higher stressed members. Using S.P welds gives a higher quality assurance in the weld. 1. Visual Scan – Inspections generally start with a visual scan to identify any gross defects or missing welds. A closer visual inspection is then carried out on a percentage of the weld work. 2. Non-Destructive Testing (NDT) – NDT such as magnetic particle testing or an X-Ray will follow to pick up any small defects. Weld inspections are a key safety step as they identify mistakes and defects. Records of testing must be saved and presented to customers at the completion of a job. How Do I Choose a Quality Welding Company? If purchasing metal fabrication products such as forklift attachments and crane attachments, always choose a company who manufactures to Australian Standards (AS1554.1), uses fully qualified welders, and test their products to meet safety standards.